This line is closed. The railway formed an integral part of what became known as the "Waverley Route" which ran between Edinburgh and Carlisle. It's closure was one of the first mainline railway closures in Britain. Occasionally possibilities of its re-opening are discussed, sometimes associated with timber extraction at Kielder. In the meantime preservations societies have laid track and started reinstating the line between Whitrope tunnel and Riccarton. Long distance trains using the line ran between Edinburgh Waverley and Carlisle (Citadel) many continuing south by the Settle and Carlisle Line and Midland Railway route to London St. Pancras. Photograph taken on the occasion of the closure of the Waverley Route. Riccarton station from the air. A4 60019 at Hawick on 12/11/1966. This line runs through a district of low population and farming. 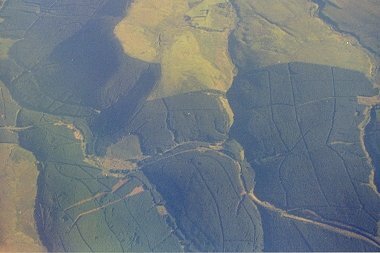 Around Riccarton Junction the area is very remote and given over to forestry. From Hawick to Canal Junction near Carlisle. The railway was owned by the North British Railway. The railway became and integral part of the "Waverley Route" Running between Edinburgh and Carlisle via Galashiels and Hawick. Much of the line ran through sparsely-populated districts and the grades and corners on the line were regarded as tortuous, the Caledonian Railway's route between Edinburgh and Carlisle being retained instead. The site of this station is now occupied by Hawick Swimming pool. The Edinburgh and Hawick Railway (owned by the North British Railway) continued north from here to Edinburgh. The station had two through platforms and a bay platform at the north end. It was on a gentle curve and the platforms were extended out in timber onto the viaduct to the south of the station. To the immediate west was the locomotive shed, goods yard and original terminus station which closed when the line was extended south to Newcastleton by the Border Union Railway. This was a siding to the south of the viaduct and station. The site is now occupied by a small industrial estate and carpark. Further south yet was the Lynnwood viaduct which crossed the Slitrig water. Regrettably this was demolished in 1982. To the north of Stobs station was a military camp which was served by a very short branch which led from a north facing junction to a station on the west side of the line. Within the camp there was a narrow gauge system. This camp was used for training during the First World War and for prisoners of War. Stobs station is now a house. The photograph shows the main building as seen from a nearby road. To the north of Shankend station is the very fine Shankend viaduct. The main station building is now a house. The signalbox can be seen in the left-hand photograph (viewed from the south) and the station area can be seen in the right-hand photograph (also from south). The goods yard was to the right in the photograph. Southbound heavy and unbanked goods trains would sometimes pause at Shankend to build up steam before continuing the climb to Whitrope summit. Since the photograph above left was taken the trackbed has become somewhat overgrown and a rockfall occurred at the tunnel entrance. Fencing has been erected about the tunnel entrance to prevent entry. Immediately to the south of Whitrope Tunnel was Whitrope Siding where trains and bankers could take refuge. The photograph shows a location slightly to the south of the siding and signalbox. The view looks north towards Whitrope Tunnel. A short section of track, from Ribblehead Quarry on the Settle and Carlisle Line, has been reinstated here and some rolling stock is stored here. Just to the south is the "Golden Bridge" so named due to the expense of building it. Riccarton station from the air, with superimposed lines. This was the junction between the Border Union Railway and the Border Counties Railway. The station consisted of a large island platform with a single track bay platform at either end. The northern bay platform was filled in at an early date. On the platform was a station building, the local branch of the co-op and a telephone box. On the northbound side of the station were a large number of sidings and an engine shed. On the southbound side were further sidings and the coaling stage for engine. Up the hill from this location was a village built by the North British Railway for the railway employees. Employees had to travel by train to go shopping and attend church as there were no roads to the location. In the 'v' of the junction at the south end of the station was a signalbox lying between the lines to Carlisle and Hexham. Some of the platform remains along with a single small shed and the schoolhouse from the village the North British Railway established here. The shells of other building remain also. Recently one of the small trackside buildings has been renovated and a number of artefacts stored here. Station signs have been erected on the former platform. This location is now a house. The photograph shows the location viewed from the north. This station was to the north of a level crossing. It had two platforms and on the east side to the north of the station a goods yard. There was a signalbox by the level crossing and a railway building still stands here. On the night of the closure of the line a protest was held by local people who occupied the level crossing to block the progress of the last train. The local minister was arrested and it was at the intervention of one of the passengers David Steel M.P. (who had opposed the closure of the line) that the minister was released without charge and the train allowed to proceed. The station here has been demolished although the solum of the line remains intact. The goods yard has been developed for housing. The left view looks north from the level crossing. This was the official Scotland/England Border of the route. The photograph looks south, staggered platforms existed on both sides, with a siding on the right hand side, the remains of the level crossing directly behind is Scotland/England Border of the road too. A signal box stood to the right and behind this view. The name is pronounced "Kersipfoot". In fact the line crossed and re-crossed the border a few times in the immediate area but this was a sensible location to have an official crossing point. This was a very short lived station. Nothing appears to remain of it. The station building here still stands. This was the junction between the Border Union Railway and the Langholm branch. The station consisted of three platforms, built in concrete with the junction immediately to the north. The location of the station is now inaccessible being a private farm. The station closed with the closure of the branch. The photograph shows the view looking south towards the junction. The muddy trackbed of the Waverley Route can be seen in the foreground and through the trees on the right the route of the Langholm branch crosses a viaduct (and also the Scotland/England Border). This was a two platform station with a level crossing to its north. The former station retains its building and platforms. The canopy of the building has a script reading "Speed and comfort by rail". This was a two platform station with a level crossing to its south. South of the crossing was a tall signalbox on the west side of the line, a north facing junction for the Gretna Branch and further south still the main line crossed the Esk on a large viaduct. Longtown station, the viaduct and the junction for Gretna to its south have been totally demolished and the land reused. In latter days the junction was used to gain access to the Kingmoor Marshaling yard, just north of Carlisle, there being no direct access to the yard from the Waverley Route. In those latter days the Gretna bound track remained in place, the track for coming from Gretna and running to the north was lifted. Much of the former branch from Longtown to Gretna remains in existence to serve an MOD base at Longtown and Smalmstown. The line remains intact running west from here to Gretna. At Smalmstown a tight west to north carries a line into the Smalmstown depot from the old Gretna branch's alignment. East from this former junction to the former junction at Longtown the line has been lifted and landscaped. West from this point the line serves, via many sidings on its south side, the extensive Longtown site. This terminus station was served by a line which approached from the south having come east from Longtown and then split at a south facing junction one line joining the Caledonian Railway at a north facing junction to the south of their Gretna station and the other running parallel to that line to the station. There was an exchange of traffic with the Glasgow and South Western Railway via Gretna and a short section of Caledonian Railway. The station building here remains standing hard by the Caledonian Railway's Gretna station. 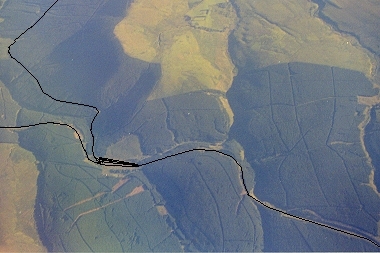 The original connection (formation still visible) with the main line has gone but was replaced with an east to south connection at Mossband Junction with that line. A further emergency connection exists further south. Eastwards the line runs to the Longtown and Smalmstown depots. An obscure extension of the Longtown to Gretna line was made by the Ministry of War running west to Annan Powfoot on the Glasgow, Dumfries and Carlisle Railway of the Glasgow and South Western Railway which served further stations such as Gretna Township. The line passed under the Caledonian Railway to the south of Gretna. This line is lifted except at its extreme west end. 1/3 of a mile to the north of the old station a peat moss railway system is used to aid the extraction of peat from moorland. This photograph looks north from the remains of the level crossing at the former two platform station. The building is now an attractive house. The base of the signalbox remains on the north side of the level crossing, west side of the line, as a shed. The former signalbox here remains standing. This was a private military halt with two timber platforms and a few sidings. The site of the station is now much overgrown with trees, the platforms appear to have gone. Some of the trackbed has been occupied by recently built houses (January 2005). To the immediate north of the station the line's solum is severed by the M6 which was apparently built across the route on the level to block re-opening of the line. This was the site of MOD sidings. These have gone to be replaced by a rail connected distribution depot warehouse. Here the Waverley Route crossed on a slight rise over the main line of the Caledonian Railway. 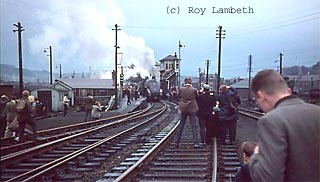 Shown; a Deltic locomotive heading south out of Kingmoor Yard under the Waverley Route. A single track still exists on the bridge to provide access to Brunthill transit depot not far to the north. At this location there were sidings and reversing spurs giving access to Kingmoor Yard from the Waverley Route. Today a reversing spur from Kingmoor Yard still exists which has its buffers at the level crossing, trains for the nearby Brunthill depot use this for access to a short stub of the Waverley route. At this location the Border Union Railway joined the Carlisle and Port Carlisle Railway and Dock Company line from Carlisle. The North British Railway acquired the branch from Carlisle to gain running powers to Carlisle Citadel station along the metals of the Caledonian Railway. A mainline engine shed existed at this location which was approached by a line in the 'v' of the junction. A tall and imposing signalbox presided over the junction. The site of the shed is now derelict but the bases of buildings can be found in the grass. To the north a disused large stone bridge still crosses the River Eden.